Perfect for banks, museums, movie theaters, and cafeterias, this Aarco HS-7 satin 40" tall guidance stanchion helps keep crowds and lines neat and organized. Use it to create straight lines and prevent line ducking, or use it to keep a crowd away from art pieces or prohibited areas. It has three belt clips and one 7' black retractable belt for ultimate versatility. Plus, the sleek satin finish provides a stylish look that won't detract from your casual or upscale venue. To ensure maximum stability during use, this stanchion's heavy weight base stops it from tipping or falling over. The base is also made of solid stainless steel for long-lasting durability in even the busiest of environments. The rubber floor guards on the bottom of the base also help to keep the stanchion in place while protecting your floors from scratches or scuffs. 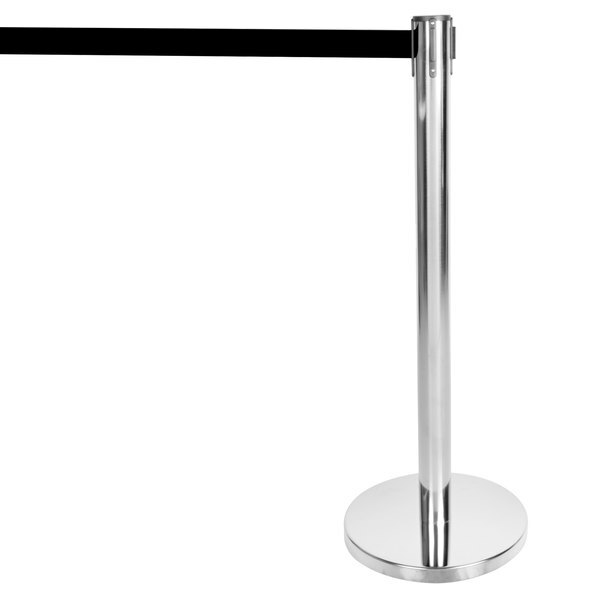 Use this guidance stanchion to organize crowds with ease!